Abstract: This article traces the history of Rajinikanth movies and how a neo-tribe was formed through the lens of Mafessoli’s neo-tribalism theory. 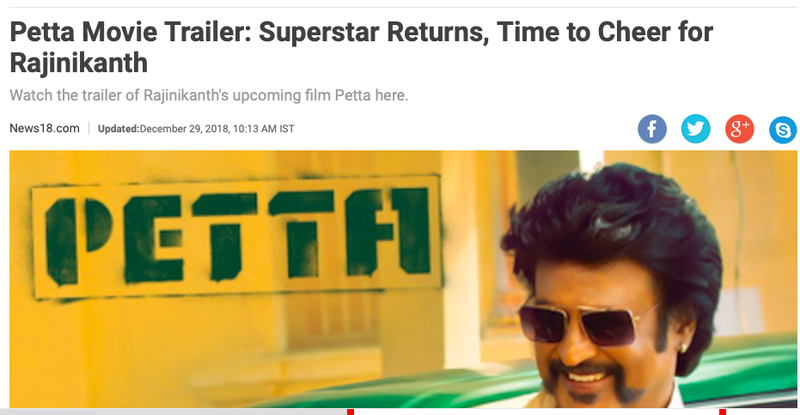 It also elaborates on how this neo-tribe is immersed in a Baashha syndrome and how Petta used this syndrome to market the movie. In the end, I make a case for why Rajinikanth will not be able to convert his neo-tribe into a political movement. I watched Petta at Cineworld in Bracknell, UK. Bracknell has one of the largest communities of South Indians especially Tamils, most of them working in the software industry. The M4 corridor that includes Berkshire, Swindon and Thames Valley is described as the “Silicon Valley of the UK” and no doubt we have so many software engineers from India. The Indian diaspora (especially the Tamil diaspora) is culturally active and known to create heterotypic spaces to relate to their roots. Movies are the best examples of heterotopic spaces because movies influence the daily life, politics and cultural icons in Tamil Nadu (Ravindran, 2006). Rajinikanth’s movies during a festival are considered being more like a carnival, and there is not a better heterotopic Indian film than Petta for this Pongal (2019), the Tamil Harvest Festival. Rajinikanth also evokes euphoric reactions in the minds of his fans. While watching Petta, I had a scene to scene narration/commentary by an enthusiastic 50-year-old fan sitting behind me. Also, he was encouraged by a lady throughout the length of the movie. The commentary included dialogues from Petta, explanations to Rajinikanth’s actions, specific easter-egg identifications and a throwback to Rajinikanth’s most famous movie ever, Baashha. Some over-enthusiastic fans wanted Kaali (the character’s pseudonym in the movie) to utter one of the famous dialogues from Baashha “Enakku Innoru Per Irukku” (I have another name). Incidentally, in Petta, Rajinikanth has another name called “Petta Velan”. 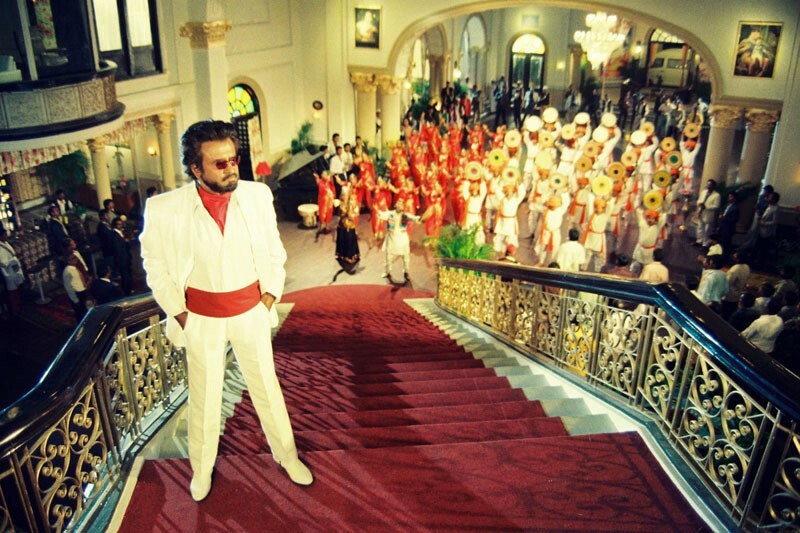 Baashha (1995) is the quintessential film in the career of Rajinikanth and for his fans. Incidentally, it was released on the Pongal day of 1995 and became a blockbuster hit and celebrated a silver jubilee (25 weeks of theatrical run). However, the cultural impact and its influence on Rajinikanth’s fans are far-reaching than the economic benefit of the movie. The movie was based on the Hindi movie Hum (1991) in which Rajinikanth had a supporting role. Although there were logical loopholes in the movie, Baashha is considered being one of the most entertaining screenplays in Tamil cinema. The first half is subtle with no significant action sequences, doused with comedy but teases the audience for the upcoming onslaught in the second half. The high-point in the intermission is one of the best in Tamil cinema. Baashha’s 100th-day celebration was the turning point in Rajinikanth’s political career. It was in this gathering he spoke about the political situation in Tamil Nadu and against the then Chief Minister J Jayalalitha. It was widely expected that he would enter politics along with Tamil Manila Congress (TMC), a faction that separated from Indian National Congress. Eventually, he supported the TMC-DMK coalition (but did not campaign for them). With the widespread distrust in Jayalalitha’s government, corruption allegations, the idea of rebel TMC and support of Rajinikanth, TMC-DMK coalition had the most significant mandate ever in Tamil Nadu elections. I would divide the career of Rajinikanth as Pre-Baashha and Post-Baashha because of the impact of the movie. The rise of Rajinikanth as the superstar is well documented, but the important reason he became so popular was that he was unconventional. 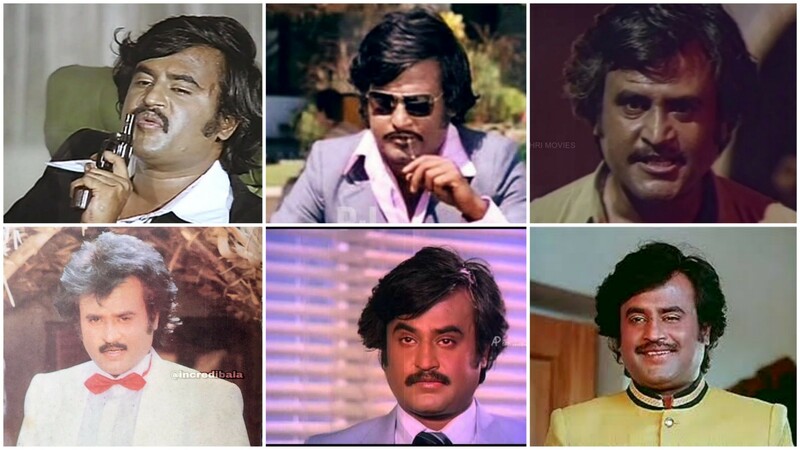 He did not adhere to the existing norms of Tamil cinema and created his charismatic style (it could have been natural or an attempt to differentiate himself from others) (Pugsley et al., 2016). He was relatable to the everyday Tamil man because of his dark complexion and the non-elite background. The other important aspect of his success is that he carefully adopted the ‘Angry young man’ trope of Amitabh Bachchan (his contemporary in Hindi Cinema). The 1970s political turmoil and the rise of unemployment pushed the film-makers to make movies that cater to the underprivileged. Amitabh Bachchan became the poster boy of those type of movies. The hero was usually portrayed as a violent young man who has an utter disregard for the rich and single-handedly fights the corrupted system to fetch the intended justice for the poor (Rao, 2007). The hero was shown using violence to achieve what he considers the proper end to the issue. Although there were many movies including Deewar (1974) and Sholay (1975), it was Zanjeer (1973) written by Salim-Javed and directed by Prakash Mehra that brought the ‘angry young man’ image of Amitabh Bachchan (Rao, 2007). Zanjeer was the most important film in Amitabh’s career because he had he had 12 flops before he was signed for the movie (Ayaz, 2017 ) Without going into the details of the movie, the movie inspired Rajinikanth and directors of his movies to adopt the ‘Angry young man’ image in Tamil cinema (Ayaz, 2017). When he started, Rajinikanth did not shy away from acting in smaller roles or villain roles as long as they had a compelling screen presence. Between 1975 and 1979, he had acted in over 40 movies, and some of them were successful combinations with Kamal Hassan. Kamal Hassan and Rajinikanth parted ways and decided not to act together after Ninaithale Inikkum (1979), a movie directed by their mentor, K. Balachander. Although Rajinikanth had acted in some remake movies, Billa (1980) became the first significant remake hit for Rajinikanth. Thus was born the angry young man image of Tamil Nadu with a string of hits like Thee (1981, Deewar), Padikkathavan (1985, Khud Daar), Mr Bharath (1986, Trishul), Velaikkaran (1987, Namak Halal), Dharmathin Thalaivan (1988, Kasme Vaade), and Panakkaran (1990, Laawaris). The Tamil directors created original stories (some of them inspired by Hollywood movies) or brought in remakes from other South Indian languages to feed the angry young man image of Rajinikanth. Courtesy: www.rajinifans.com. Interesting to note that this image has been used by the fans because in this scene he slaps Vijayashanti. The misogynistic tropes used in Amitabh Bachchan movies (Singh, 2018) were continued in Rajinikanth movies. The movies showed that liberated women have to be tamed into a silent, devoted and “wife” material. Filmmakers showed this through the change of attire — a woman with outfits like Jeans and shirts would turn to sarees the moment Rajinikanth’s character tames her. The best example is Mannan where a successful businesswoman (played by Vijayashanti) was shown as being tamed by her husband played by Rajinikanth. Ranjani Krishnakumar (2017) in her analysis of Mannan (1992) says the movie is “a fight between a woman in power and a man in of the people, who are reluctant to take power into his own hands, but wants to steer his people towards whom he believes deserves that power, which certainly isn’t her”. It’s not that only Rajinikanth movies showed blatant sexism, it was the norm around the Tamil cinema, and there were only a few decent portrayals of women in Tamil cinema during that period. In the Pre-Baashha era, Rajinikanth stayed away from politics and carefully trod the path because during his career development period, MGR, who also wielded power in the film industry ruled the state. As mentioned earlier, it was Baashha’s 100th-day celebration that changed the mindset of Rajinikanth and his fans. In a way, Baashha was a boon and a bane for Rajinikanth. Except for Muthu (the next blockbuster after Baashha) and Chandramukhi (a comeback movie after the disastrous Baba), Rajinikanth was overtly political in most of his movies (Enthiran is another non-political movie). Rajinikanth was supposed to do Mudhalvan (1999) with Shankar — a story about how a reporter becomes the chief minister of the state (Ramachandran, 2014). Although the official word is that the movie did not materialise because of dates, the grapevine is that Rajinikanth did not want to upset the then government of Kalaignar Karunanidhi, whose coalition Rajinikanth supported. According to his fans, the movie could have been his pinnacle and could have changed the political fortune of their star. Baba (2002) was an overtly political movie but did not succeed as planned. The ending invited his fans to speculate about his political entry (Srinivas, 2016) and that is the time what I call “Neo-Tribe of Rajinikanth” emerged. Michel Maffesoli, a French sociologist, proposed the idea of neo-tribalism and neo-tribes. While the sociologists around him were talking about the extreme individualisation and the dissolution of society, he came up with this controversial idea in the 1990s that people are part of neo-tribes that are temporal, ritualistic and had a strong collective identity (Tribaling, 2009). Neo-Tribe is defined as small masses of people with a shared experience, and this experience creates meaningful “links” (social relationships). It differs from a “segment” (in marketing terms) regarding the composition. Tribes consist of heterogeneous people while segment comprises a homogeneous group (Cova and Cova, 2002). According to Maffesoli, any neo-tribe has five major aspects associated with it. 1. Affectual Nebula — a collective aesthetic consciousness that enables the members to connect, engage and relate to each other. With Rajinikanth’s tribe is the collective sense of belief that Rajinikanth is the only superstar and he prevails(ed) over the competition over the years. It also includes that Baashha is the best movie of Rajinikanth’s history. There are other sets of beliefs that tie his fans together like the un-celebrity like off-screen personality, the spirituality he openly professes and agelessness of the actor. 2. Undirected being together — there is a natural grouping of the tribe when the shared experience occurs. 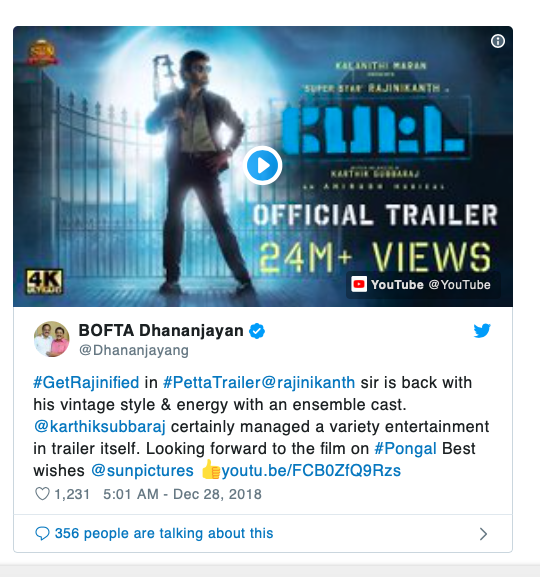 For example, the sudden rise in social media activity during the release of a Rajinikanth movie or even the trailers/songs. The same goes concerning conducting ritualistic traditions in the theatres. Maffesoli calls this vitality as puissance — the inherited force of the people that drives them. The first day first show of a Rajinikanth movie is the perfect exposition of puissance. 3. Religious Model — Neo-tribes use religious metaphors and organically created rituals. Maffesoli also invokes the idea of demo theism (people as God) could be a centre-piece of the neo-tribe. Rajinikanth has a demigod status among his fans but the idea of palabishekam (ritualistic bathing with milk) of his banners and cut-outs, the garlanding, the ritualistic procession of the film canisters (when it was in usage) and pooja in front of the imagery are all from traditional rituals conducted for Hindu Gods in India. 4. Elective sociality — Identifying with the neo-tribe is by choice and not by force. Also, there is no need of explanation needed concerning Rajinikanth’s neo-tribe. Marketing to a tribe is not an easy task, and when they are engulfed in a nostalgia syndrome, it is even tougher to present a product that can be widely accepted by the tribe. The neo-tribe of Rajinikanth after the failure of Baba entered into a nostalgia syndrome that kept them away from thoroughly enjoying the films of their star. Although Shankar’s Sivaji and Enthiran were box-office hits, certain sections of the tribe didn’t want to accept these movies as the typical “Rajini” movie. The movies did not talk to the faithful group of the tribe (Prasad, 2014). The tribe is immersed in the idea of Baashha syndrome that drives their consumption of Rajinikanth’s movies and how they perceive their opposition. Here, the word syndrome has not been used in the traditional medical definition but syndrome as “a set of concurrent things (such as emotions or actions) that usually form an identifiable pattern” (Merriam-Webster). Baashha Syndrome is a nostalgia syndrome that has engulfed Rajinikanth fans. 1. They expect every movie of Rajinikanth to emulate or surpass Baashha in terms of heroic moments. The storyline of Baashha has been tried by every other young actor (Jana, Madhurey) and it has failed miserably in the box office every time. 2. They valiantly defend the movies made by Rajinikanth that does not conform to their norms (for instance Kaala and Kabali) but secretly yearn for the nostalgic image of their idol from Baashha. Linga tried the usual method to pander to the fans but failed miserably at the box office. 3. They make fun at the extreme adulation of fans of other actors (especially Vijay and Ajithkumar), but they show similar extremism in defending Rajinikanth’s movies. The best example was the experience of Anuradha Sengupta, a Journalist from CNN-IBN (now News18) when she wrote a blog post on the corporate blog of CNN IBN. She encountered the wrong side of Rajinikanth fans. This was the time when Twitter and Facebook just entered India (adopted only by the techies and geeks). This image sums up the response. 4. They cannot accept that there are movies with better box-office collections than Rajinikanth’s movies. In the past, there are movies of Kamal Hassan (eg:Thevar Magan) and Vijayakanth (eg: Chinna Gounder) that have surpassed the box-office collections in direct competition and in recent times, Viswasam was drubbed in social media because of the reports that the Ajith starrer had made more money in the box-office regarding Tamil Nadu collections. Baashha Syndrome is hugely prevalent with the inner circle of the Rajinikanth neo-tribe, but it is also fuelled by the outsiders who join the tribe during the release of his movies. The media, celebrities and other young actors reminisce the image of Baashha during the release of other Rajinikanth movies. How Petta used the Baashha syndrome? According to Weaver (2011), use of nostalgia is one of the widespread marketing practice that helps to sell a product. Nostalgia is essential to the availability to the identity-for-purchase because it constructs the present as the past that the consumers want to revisit (Weaver, 2011). The best examples are the Paper Boat advertisements that brought back typical Indian childhood imagery. To market a product or an experience through nostalgia, there should be a sense of loss. Losing the construct that is primary to the product or experience will help people embrace nostalgia. Petta was announced in February 2018, but the first look was released in September 2018. The announcement of the release of first look motion poster from Sun Pictures accompanied by a small video that retraced the different posters of Rajinikanth movies from his first movie. Although 2.0 was making its way to the theatres, the two movies before 2.0 were constructed as “not a typical Rajini movie” tag. Pa Ranjith tried to create a different Rajinikanth through his movies, and even Rajini played his age which deviating from his usual tactic. 2.0 released in November 2018 was a box-office hit, but the primary marketing vehicle of the movie was not Rajinikanth but the technical brilliance of Shankar and the effort behind the movie. The stage was set for Petta, and the makers deliberately played on the nostalgia bit. The character was named Kaali (the character name of Rajinikanth in Mullum Malarum and there is also a Rajini movie in the same name). #GetRajinified was the official hashtag used for the movie. The makers slowly warmed up to nostalgia, and even the sudden release date announcement for Pongal 2019 was a surprise because Tamil Nadu Film Producers Council had made a rule that there will not be big hero movie clashes on festival days. Viswasam, with Ajith (an actor known to be “King of opening” because of his huge fan following) in the lead, was slated for Pongal 2019 release. 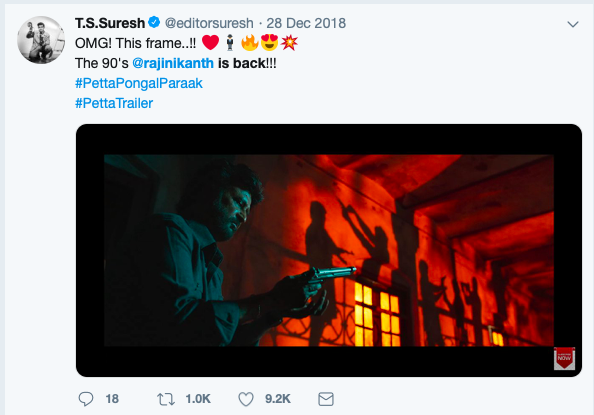 However, Sun Pictures, the producers of Petta were determined to release it on Pongal day because Baashha released on a Pongal day and the last Pongal day release for Rajinikanth, Chandramukhi was a huge box-office hit. The makers (Karthik Subbaraj) and Sun Pictures kept on harping the nostalgia bit. For instance, Anirudh (the music director), invoked Thillu Mullu Football stadium scene as his inspiration for Ullala song and roped SP Balasubramaniam (SPB) to sing a small part of the first single “Mass Maranam”. SPB sang many introduction songs for Rajinikanth including Naan Autokaaran from Baashha. 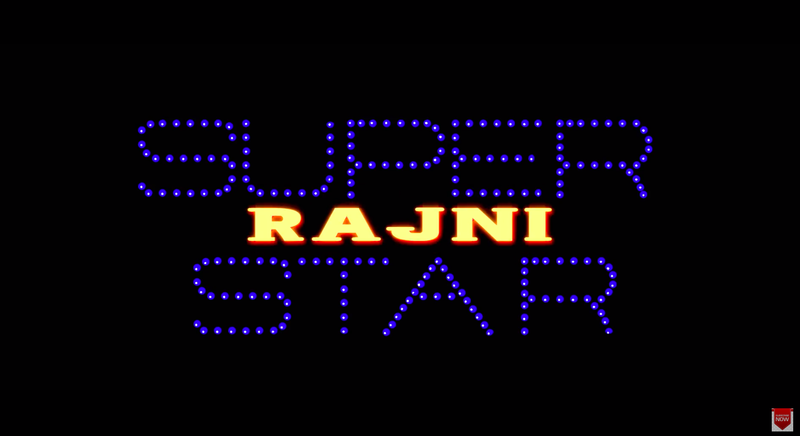 The teaser released with the typical “Super Star” imagery that was last seen in Chandramukhi (2005) that was another nostalgic symbol that the fans missed. 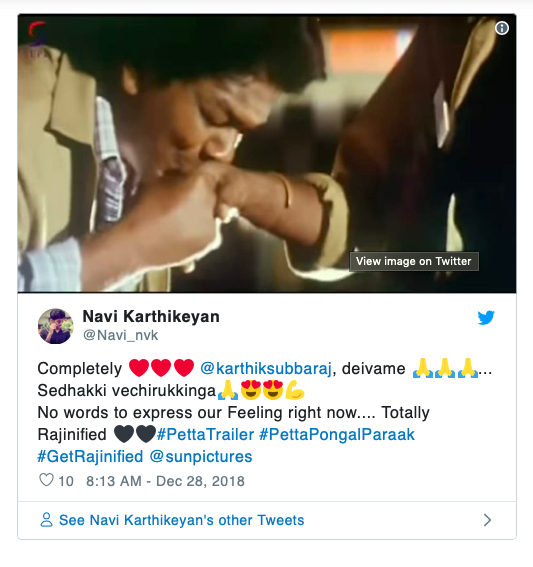 When the trailer hit the screens, the neo-tribe of Rajinikanth had warmed up to the nostalgia as the comments ranged from how Karthik Subbaraj has brought the 90s vintage version of Rajinikanth and how Pa Ranjith should learn to make a “Thalaivar” movie (Just give a search on Twitter for the term “Pa Ranjith learn”). One important thing common among the reactions from celebrities, fans and media was that “Rajinikanth is back” as if he was lost somewhere in the realm. This was a clear case of discrediting the previous two movies especially but carefully staying away from 2.0 because the movie was still running in the theatres. 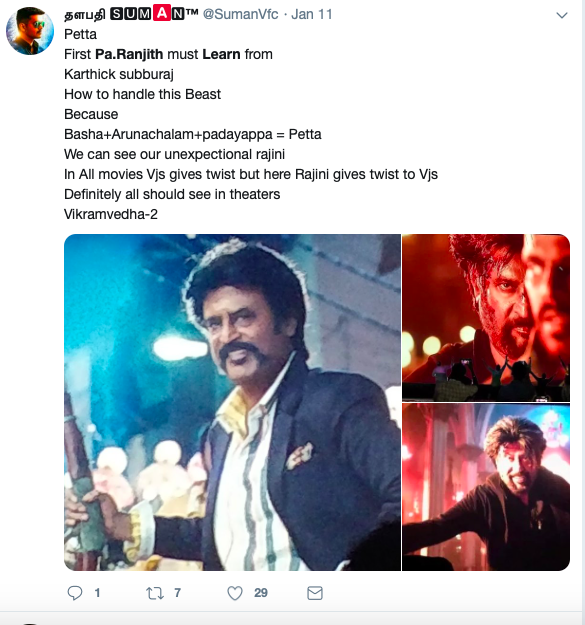 In some tweets, images from Baashha were invoked to celebrate Karthik Subbaraj. Petta as a movie was a nostalgic trip. The reviews echoed the same sentiment, and the fans listed the nostalgia easter eggs that were left for them to discover. However, the problem was that the movie was nothing but a nostalgia trip. The movie had a patchy screenplay, with a host of stars being wasted in smaller roles and an age-old story. Although some reviewers pointed it out that the movie is just string of tributes, the movie was a hit among his neo-tribe. The movie’s box office collection was also pushed forward because of its clash with Viswasam (the media hype and fan clashes surrounding this were nostalgic too) and the long holiday week in Tamil Nadu because of Pongal. There is no point in elaborating the different nostalgic moments of the movie. I would rather leave a video and an article for you to explore (in fact, I could not identify Rajathi Raja scene). Petta is a beautiful case study of marketing to a neo-tribe, and the movie was designed to be a nostalgia vehicle. It will be difficult for the director next-in-line, AR Murugadoss to match the nostalgic effect of Petta. He might go the Shankar way of treating Rajinikanth in an entirely different avatar, and it could be too risky given the neo-tribe has just experienced an almost Baashha or at least they were made to believe so. Can the neo-tribe become a political movement? The bigger question is whether Rajinikanth can develop his neo-tribe into a political movement. As noted earlier in this article, the Baashha period was the best time for his political entry. The stage was set for Rajinikanth to enter politics with TMC and DMK coalition. There could be a multitude of reasons for Rajinikanth staying away from entering politics in 1996 including the revival of his career with Baashha. It is interesting to note that since then, most of his political statements coincided with his movie releases. While the political parties were trying to use his stardom, he was using politics to propel his movie box-office collections. 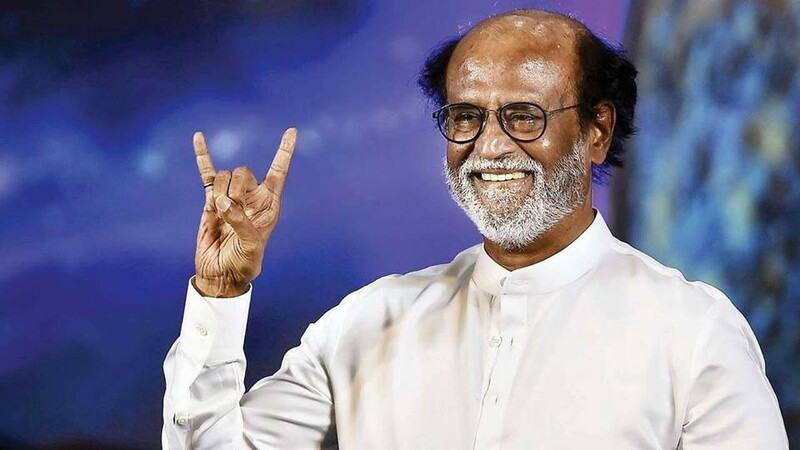 Eventually, after the demise of both Jayalalitha and M Karunanidhi, the two pillars of Tamil Nadu politics in the last 30 years, Rajinikanth announced his impending entry into politics. Though he has not officially announced a party or contesting the upcoming parliamentary elections in 2019, the news is that he has been strengthening his grassroots fan clubs through streamlining the office bearers and registering unofficial fan clubs (official fan club registrations were stopped in 1995). While discussing the politics of Rajinikanth, two examples constantly crop up from his supporters. MG Ramachandran and NT Ramarao — the two famous film stars who became the Chief Minister of Tamil Nadu and Andhra Pradesh, respectively. However, although they were film stars, their ascension to the throne was because of different strategies. MGR (as MG Ramachandran was fondly known) was a party activist in DMK. He started as a low-level party activist and rose to become the Treasurer of DMK in 1969. He was also instrumental in the party’s success during 1967 elections and became the Member of Legislative Assembly in the same elections. He won the seat from a hospital bed after the infamous shooting incident by MR Radha. On the other hand, NT Ramarao came to power through Telugu nationalism. Indian National Congress was in power since the inception of Andhra Pradesh in 1956, and the party was in tatters in 1982. They had 5 Chief ministers in 5 years. He went on a colossal campaigning spree (covered 75000 KMs) across the state in an open Chevrolet van called Chaitanya Ratham (a concept mastered by MGR), and the campaign was about self-respect of Telugu people. His party’s name was Telugu Desam Party. Fun fact: NTR campaigned for MGR in the 1984 TN elections as MGR had to be in the USA for health reasons. Rajinikanth has neither of these strategies in his favour. His appeal of Aanmiga Arasiyal (Spiritual politics) has been criticised heavily because of the lack of a clear agenda or stance in specific political issues. He cannot take the Tamil nationalism (widely purported by Seeman of Naam Tamilar Party) or the Dravidian politics (DMK and ADMK’s grassroots) as he proposes an alternative to these contradicting narratives. Neo-tribes need a shared consciousness and thought process that will drive them to an apparent expected conclusion. The problem is that Rajinikanth’s political ideology is not as strong as his movie strategies. His statements are so naïve and inexperienced for specific questions about the issues in Tamil Nadu. For instance, in the latest statement where he announced that he would not be contesting in the Lok Sabha elections, he appealed to the people they should vote for the party that would solve the water issues. This was the same statement he gave in 2004 when he indirectly supported the BJP-AIADMK coalition (Srinivas, 2016). Vijayakanth, who entered politics in 2006 with his party DMDK could garner around 10.04% of the votes in Tamil Nadu during the 2009 Lok Sabha elections, but he could not win a single seat. In 2011 elections, Vijayakanth won a whopping 29 out of 41 seats contesting as a coalition partner with AIADMK. However, he could not win a single seat in 2016 elections, and he was touted as a Chief Minister candidate of the Makkal Nala Kootani that had MDMK (Vaiko), VCK (Thirumavalavan) and the Communist parties. This showed how difficult it was to break the duopoly of DMK-ADMK in Tamil Nadu. The same can be said about Chiranjeevi in Andhra Pradesh. He still cannot break into the big league even after the untimely demise of Rajasekhara Reddy, the charismatic Congress leader from the state. 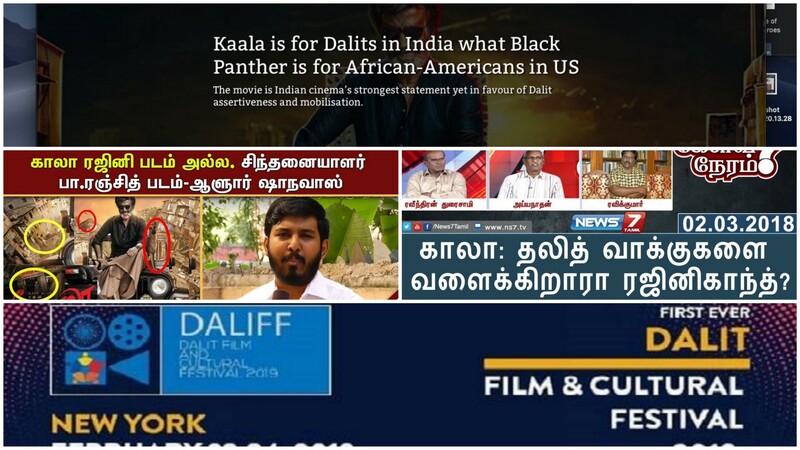 The expectation of most political entries in Tamil Nadu (especially from movie industry) is that the state is void of a strong political hand, but the problem is that they do not understand the cadre politics of Dravidian parties that are deep-rooted in Tamil Nadu. The strength of MGR, Karunanidhi and Jayalalitha was not their popularity but their shrewd politics, welfare schemes and the advantage they wielded over the centre through their power strategies. Neo-tribes are temporal. The Rajinikanth neo-tribe would comprise fans from different political parties, activists and even fans of other actors. A movie is a short-term experience, but a political party is a long-term movement. The age of converting a tribe into a political movement has died with MGR and NTR. The future is bleak for Rajinikanth’s politics, but his movies will stay forever because the neo-tribe is waiting for its next nostalgic trip. Prasad, M.M. (2014) Cine-politics. Chennai: Orient Blackswan. Sylvianism started as a personal blog that views and skews of Sylvian Patrick. Now it is slowly moving towards a multi-authored blog with writers from different walks of life. You will find articles on movies, music, marketing, food, gender issues, politics, humour and poetry.